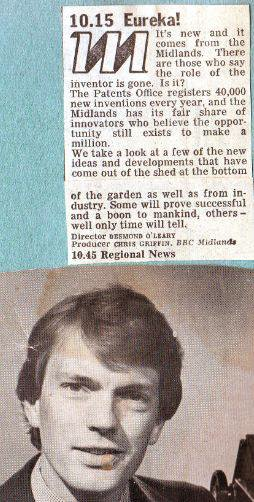 Cutting publicising Eureka, a BBC Midlands one-off show presented by Alastair Yates, with Jan Leeming, in 1979. The show spotlighted inventors from the Midlands. The director was Desmond O’Leary, and the producer Chris Griffin. Thanks to Alastair Yates for sharing the cutting. Hi all. It was 1979 and I co-presented with Jan Leeming. Sadly it was a one-off prog.